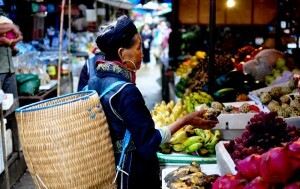 Sapa market located at the center of Sapa town and and is opened every day. But it is most crowded on Saturday late afternoon and evening. Before the French built Sapa town into a town, the market place was on the sandy ground about 7 km east of the town now, at the junction of the main road to Lao Cai and the trail to Ta Phin Village. Until 1980s, when the population of the region was small and transportation was very poor, It was really hard to communicate among villages, the market offered probably the only chances once a week for H’mong and Red Zao peoples to meet others. The main market took place on Sunday but many went to the market the afternoon before because their villages were too far and it took many hours to go on foot. Of course there were no accommodation for rent then, so for passing the night they gathered around fire talking, playing their traditional music, dancing… Gradually these activities attracted the youngsters from villages near by to come and turned the market into a dating place for lovers. Nowadays, due to fast development in the region to make it easy for locals to communicate among villages, as a result, the market in Sapa has been becoming less important spiritually. However, it is still crowded every weekend and worthwhile to spend few hours to join local for a life experience.